The Aristo ART-5460 "Ultima" power supply is a constant voltage DC power supply designed to power the ART-5471 Train Engineer and ART-5401 wired throttle. It is rated at 10 amps output. This unit is basically an unregulated, filtered power source built into what looks like a battery charger case. It has only the one DC output so if you need AC power to run accessories, you'll have to use another source to provide the AC power. The unit consists of a conventional transformer, a full wave rectifier, two filter capacitors, a fan, a thermal circuit breaker and a meter. This is about as basic as it gets. The 5460 will put out a full 10 amps as advertised, but its output voltage is just a little lower that some people might like. I find that under load, the voltage that is applied to my track is maybe a couple of volts lower that I would like on some occasions. This has an upside and a downside. If you like to run your trains REALLY fast, then you will want to find a power source with a little more juice. However, I have found that for most applications, the voltage is just high enough to reach reasonable speeds and still keep my trains from derailing on the curves except on that one downhill stretch where I have to watch my speed or a wreck is assured. As of Mar 99, Aristo has updated the 5460 with a little more output voltage. It appears that the loaded voltage of the newer 5460 is about a volt higher than the older ones. Aristo doesn't rate the total power output of the 5460. I was curious, so I measured it with a few precision loads of 1, 2 and 3 ohms. I find that at the rated current of 10 amps, the output power of the 5460 is 168 watts for the older one and 177 watts for the newer version. As can be seen on the graph, the unit will supply more than 10 amps. It can deliver 15 amps to a 1 ohm load, but I didn't test it very long there to protect my load which is rated at only 100 watts. At this current, the output power is 225 watts. I do not know the trip current of the circuit breaker, but it didn't trip at 15 amps in about 30 seconds. I did try to add considerably more output capacitance to the unit to see if more filtering would boost the average output voltage. It did not. The 20,000 microfarads that are installed already appear to be adequate. The 5460 is not ideally suited to providing constant track power for receivers mounted inside the locos. Since it has such high output current capability, a derailment that causes a short circuit will draw a lot of current until you can get there to clear the short. By that time, you will have probably melted some power pickups or toasted some wiring since there is no remote way to shutdown the track power. During the first day that I used the 5460 for constant track power (without a fuse), I melted the contacts of a Lionel Atlantic and the wiring of an FA-1 after accidents. A fuse was quickly installed. If the 5460 is driving a 5471 trackside receiver, it may blow the receiver fuse after a track short. In any case, it is a good idea to hit the Emergency Stop button on the TE transmitter at the first sign of a derailment to minimize meltdowns because wiring resistance may limit the fault current to levels that do not blow the fuse. If the 5460 is used to provide constant DC track power, then an additional fuse MUST be used to protect your equipment. The 5460 will protect itself, but a short circuit will likely result in damage to your trains before the internal circuit breaker trips. Install some kind of fast blow fuse in one of the output lines. Select the fuse size by using a fairly small one at first, maybe 3 to 5 amps, and then increasing it ONLY if it blows with no obvious cause. Under no condition should a fuse greater than 10 amps be used. Inline fuse holders for 3AG type fuses can be found at most electronics stores. Note that a fuse is not complete protection. Faults that draw less than the fuse current will not blow the fuse, but may still cause serious damage. Use the smallest fuse that you can get away with. Typical DCC boosters (the power source for DCC systems) are a little more intelligent in dealing with track shorts. They sense the overcurrent condition and shut down quickly. They then retry periodically to see when the short is cleared. The shutdown process is so fast that insufficient heating is experienced to melt power pickups or weld wheels to the track. 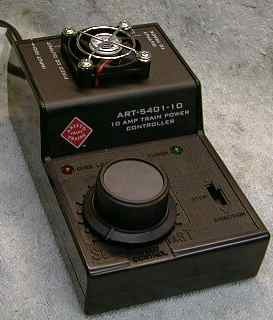 The ART-5401 controller (see below) provides this electronic fuse function so that if you have one of these devices hanging around, use it. Turn it all the way up and let it provide the protection function. Most DCC boosters need an external source of AC or DC power to operate. The 5460 can provide power to a DCC booster, but its output voltage is a little low for large scale DCC needs. It would do fine in powering a large HO or N scale layout (provided that the booster regulates track voltage). The 5460 does have some quirks which seem to be generic to the design. Noise. The unit generates a fair amount of humming noise. This appears to be completely normal. I have three older ones and one was MUCH louder than the other two due to a loose transformer lamination. Aristo fixed it upon request. The new version hums too, but not quite as much, especially under load. The unit doesn't have rubber feet, just metal bumps on the bottom to space it a little above the mounting surface. If the unit is sitting on a hard shelf, the humming noise will transfer to the shelf and the shelf will act as a sounding board making the unit sound MUCH louder than necessary. I just placed the units on a folded towel to damp noise transfer and it helped a lot. Eventually, I hung the 5460's by their soft plastic carrying handles from coat hooks screwed under the benchwork or mounting shelves. This was very effective in reducing the level of the hum. Mounted that way, the hum level and the internal fan noise were equivalent in strength. Meter Accuracy. The older unit comes with an output current meter which is not very accurate. During my tests on one older unit, I found that its meter reads about 20% high at full output and could vary from a reading of 4.5 to 7 amps at a 5 amp load. The newer one seems have a better meter. At a load of 8 amps, it read 5% low and did so consistently. Meter Zeroing. On the older units, the meter often settles down to read 1 amp even when the output is zero. If the unit is not plugged into a grounded outlet, it'll never zero. If the unit is properly grounded, it'll settle to zero sometimes. I do not have a clue as to why this happens, but it does. The newer unit seems to zero properly, grounded or not. If you have any talent at all with electronics you can build your own power supply for less money and with higher output voltage than the 5460. The key is finding an adequate transformer. Since buying one new out of a parts catalog will probably cost more than a whole 5460, you'll need to search surplus warehouses and your favorite electronic parts haunts for appropriate parts. Aristo has made the ART-5401 external throttle for many years, but recently upgraded it to 10 amp capability from the previous 3.5 amps. The new 5401 comes ready to plug into a 5460 and go. The 5401 generates PWC at the output only, there is no option to switch it to linear output like the ART-5470 Train Engineer. There are four quick connect output terminals and a 3' or so power input cable on the back of the 5401. One pair of connections provides DC power output. The current capability of this output was not rated, but I would guess that these terminals are directly connected to the input power as they are not affected by any of the controls on the 5401. The other pair of terminals go to the track. There is a small fan mounted on the unit that blows air inward, but curiously there are no vents to exhaust the heated air other than some leakage around the connectors on the back of the unit. This doesn't seem to be a problem. I tested it right below its trip current of 10.8 amps for about an hour and it didn't even get warm. This is probably because it is pretty efficient, there is only 0.5 volts of drop from the input to the output at 10 amps of output current so its total internal dissipation is only about 5 watts. I plotted the output current of the 5401 into a 2 ohm load as a function of the control knob position. For most of the range, the output current (and therefore output voltage) is pretty linear. Like the 5400 starter set pack and the older lower current 5401, the new 5401 has a small amount of momentum built in so that the train speed does not respond instantly to throttle position. The amount of this momentum cannot be adjusted. Reversing is accommodated with a slide switch with a center off position. The 5401 is overload protected. When I tried to draw more than 10.8 amps in a 1 ohm load, the overload light would flash and the unit would shut down for a few seconds and then come back on. A continuous overload resulted in continuous power cycling. There is an inline 3AG type fuse in the DC input line to the 5401 to protect it from total disaster. In my testing, I never did blow the fuse, but then again, I didn't short it out either. The 5401 could be used with the 5460 or the new CRE-55465 power supplies as an electronic fuse for a constant track voltage system. The 5401 provides the overcurrent protection that is lacking in the 5460. The 5401 could also be used set the maximum track voltage for such a system where the prime power is derived from a 24 volt power supply or a pair of car batteries wired in series.